Supply of potable water of 20 litres in each household under NTR Sujala Pathakam as per G.O.No: 127 ; AP Supply of potable water of 20 litres in a can for Rs.2.00 to each household in rural areas under NTR Sujala Pathakam - Guidelines as per G.O.No: 127 ; AP Government provide potable water of 20 ltrs in a can for Rs.2.00 to each household in rural areas under the banner of “NTR Sujala Pathakam as per G.O.No: 127. SUB:- AP Supply of potable water of 20 litres in a can for Rs.2.00 to each household in rural areas under NTR Sujala Pathakam - Guidelines. G.O.Rt.No.2426 G.A (Cabinet) Department dt.23.6.2014. G.O.Rt.No:740, PR & RD (RWS.II) Dept.., dt.25-6-2014. 1.Government took a policy decision, with a view to reduce the diseases burden especially arising out of water borne, to provide potable water of 20 ltrs in a can for Rs.2.00 to each household in rural areas under the banner of “NTR Sujala Pathakam”. Government have constituted Cabinet Sub-Committee consisting of Hon’ble Ministers of Panchayat Raj & RWS, Irrigation & CAD and Municipal Administration & Urban Development for the implementation of “NTR Sujala Pathakam” vide G.O. 1st read above and also constituted a Technical Expert Committee to recommend appropriate technologies depending on the quality of water available in each habitation vide G.O. 2nd read above. Treatment technologies: Committee recommended to go for RO (Reverse Osmosis) Technology if the TDS is more than 1000mg per ltr in the water and all other parameters are within IS Standards. Also if water contains combination of TDS of more than 500 mg per ltr, fluoride more than 1 mg per ltr, Nitrate more than 45 mg per ltr and Iron more than 0.3 mg per ltr. If Fluoride is more than 1 mg per ltr in the water and all other parameters are within IS Standards, the technology recommended is EDF (Electrolytic De-fluoridation) Technology. Terafil Technology is recommended if the iron is more than 0.3 mg per ltr and all other parameters are within IS standards. If Turbidity is more than 2 NTU in the water identified and all other parameters are within IS Standards, Ultra Filtration Technology is recommended along with Ultra Violet treatment. Disinfection shall be integral part of all the treatments. The District authorities should identify the habitations where the water quality is an issue and ensure that the Government buildings are available for installation of water treatment plant with power connection in the habitations identified. Government also decided to provide water for these treatment plants from the existing water source available in the village. The spirit of implementation of this programme is “not for profit but as service oriented”. The District Administration has also been requested to identify the potential donors, industrial houses, corporate houses, philanthropists and NGOs who would like to participate in this public service oriented programme. 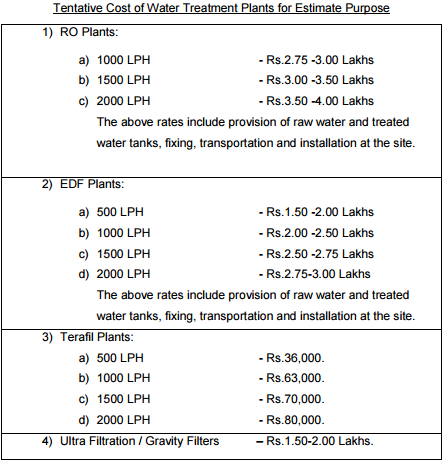 The tentative cost details of the plants and different technologies with varying capacities are given in the Annexure. The running and maintenance of these plants, once installed will be entrusted to active SHGs/NGOs or youth of the village or as identified by the District Administration. Government decided to launch the programme from 2nd October, 2014 and cover all the habitations in a phased manner. Minimum of one habitation shall be covered for each Mandal in the first phase and minimum of 300 habitations to be covered for each district in 2014-15. The capacity and number of plants will be based on the population of the habitation. Per capita supply is to be taken at 5 ltrs per person. The cans can be 20 ltrs capacity or 10/12 ltrs capacity, as per the convenience of the villagers. During first phase preference to be given where buildings with electricity are available. All the District Collectors shall follow the guidelines for doing the preparatory works for “NTR Sujala Pathakam’’. Get Download G.O Complete Information Click Here. Get Download AP G.O.MS.No.18 NTR Sujala Pathakam – up scaling - Guidelines Click Here.